Everyone was pleasant on the phone. The maintenance man called us before we arrived to let us know that he was replacing a shower head. We really enjoyed relaxing in Highlands Hideaway. We didnt really have to contact the team at all. Gorgeous cabin with gorgeous view! 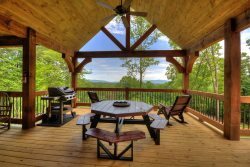 Plenty to do at the cabin itself and in nearby Blue Ridge. Loved our stay! Cant wait to do it again!